An Extra $100 an acre in Grain Corn from Underseeded Red Clover in Spring Wheat! Red Clover underseeded in spring wheat paid up to an extra $100 an acre in Grain Corn! A four year study at the Winchester Research Farm started in 2009 was initiated to look at the effect of underseeding red clover in spring wheat at different growth stages and its impact on spring wheat yield and the corn yield the following year. Red clover was broadcast seeded, at four spring wheat growth stages; 1) at planting, 2) at herbicide application (Zadok’s 26-30), 3) flag leaf emerged stage and 4) post-wheat harvest. Single-cut or double-cut red clover was broadcast at 7 pounds per acre into the spring wheat at the 4 different growth stages. Yields were collected from both the spring wheat and the following year’s corn crop in each of the respective years. 90 pounds per acre (lbs./ac) of actual nitrogen was applied to all treatments in the spring wheat crop. In the following corn crop, a 100 lbs./ac of actual nitrogen was applied to all treatments. Average corn yield of the 4 years 2010, 2011, 2012 & 2013 for each of the previous year’s red clover treatment is shown in Table 1. Based on a corn value of $4.50 per bushel, red cover added between $23 up to $100 per acre as compared to where no clover was underseeded in the spring wheat. As would be expected, red clover underseeded at earlier spring wheat stages (that is, planting or at herbicide timing) rather than later growth stages, provided more yield benefit to the following corn crop. Table 1: Average Corn Yield of 2010, 2011, 2012 & 2013 following Red Clover underseeded in previous year at various spring wheat stages. Spring wheat growers are often reluctant to underseed red clover in spring wheat due to concerns that the red clover will compete and suppress the spring wheat grain yield. Table 2 shows the average of the 4 years of 2009, 2010, 2011 & 2012 spring wheat yield of each treatment. 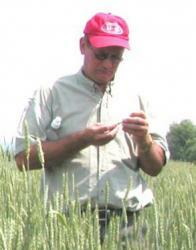 The red clover did not suppress the spring wheat grain yield, but rather had a slight increase in grain yield. Red Clover added value to Corn!